We want you to love every moment of your stay and a really important part of this includes what you eat. We are very happy to discuss in detail with you prior to your arrival any special requests or dietary requirements you have. Breakfast is served daily in our cosy, traditional stubli where everything from homemade granola and fresh yoghurt to perfectly poached eggs are readily available. Alternatively you might prefer a full cooked breakfast or just a simple croissant. We are also passionate about raw boost juices, which are made fresh every morning. Just let us know what you would like and we will do our very best to make it. 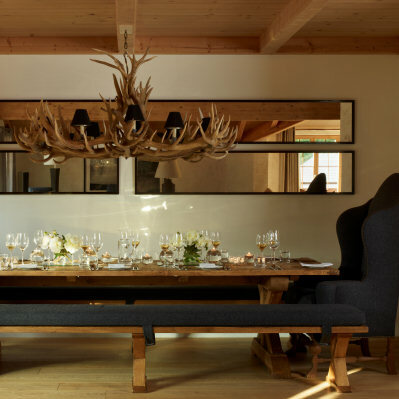 Lunch is not served at The Penthouse, however we are very happy to book any of the many great local and mountain restaurants for you. Tea is served from 4pm daily and includes a home-made cake or biscuits, plus fresh fruit, a selection of teas and coffee. Dinner (on 6 nights per week) starts with delicious canapés by the fire, followed by 3 courses created using locally sourced ingredients. Menus aim to be delicious, fresh and not too heavy. We offer everything from Ottolenghi-style salads with fillet of pork to freshly delivered fish with seasonal vegetables. The cheeses are also particularly good in Switzerland. Once a week we also offer a special mountain night. 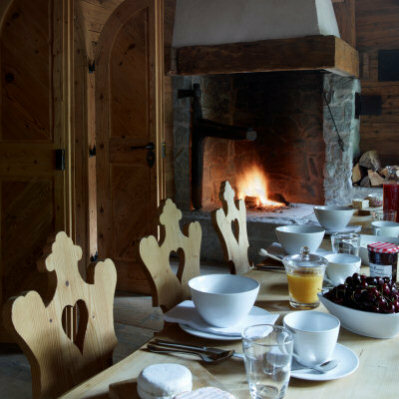 Eating by the fire in our cosy stubli where you can enjoy a traditional Swiss fondue with meat, cheese and delicious salads. Sample menus are available in advance to choose from, alternatively please let us know if there is anything you particularly require. A selection of carefully selected house wines are always available for you to order from, alternatively we are happy to purchase locally chosen wines on your behalf. "The food was fantastic. A great combination of fresh and healthy for those with good intentions, but with lots of naughty treats available too! 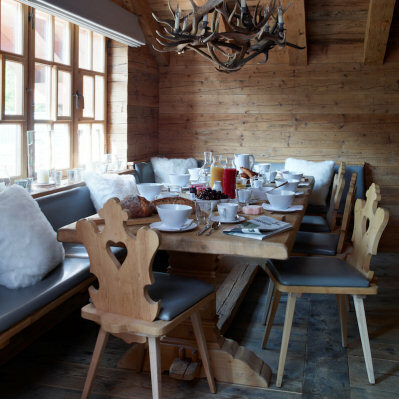 We particularly loved the mountain night in the stubli, a delicious fondue by the fire, poached eggs and great raw juices were favourites at breakfast time"